Stay visual with this Two-Tone 5-Pt. Break-Away vest from Occunomix. This safety vest features 2" silver tape: one 360° horizontal stripe and two vertical stripes. Constructed from 100% polyester mesh, this vest also includes 5 pockets, two-tone striping and 2 mic tabs. 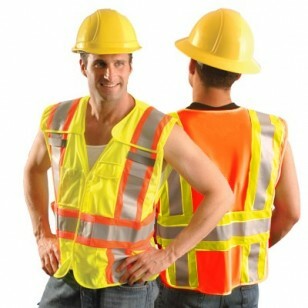 The safety vests also feature expandable sides with hook and loop closures. Meets ANSI / ISEA 107-2004 Class 2 standards. Available in orange or yellow.